A modular UPS system is one in which the uninterruptible power supply is made up of one or more self-contained power modules. The typical power module rating in modular uninterruptible power supplies is either 20kVA or 40kVA and most are unity power factor rated giving ratings of 20kVA/20kW or 40kVA/40kW. The power modules are typically housed in a vertical tower, similar to a rack cabinet and slide into position in much the same way as you would place equipment into a cabinet. Modular UPS systems provide several benefits over traditional designs but they have always commanded a higher price premium. Typically this has been in the region of 20-30% more. However recently launched modular systems are starting to reduce the gap and offer a range of features that make the price premium worth paying. With floor space being a premium in many comms rooms and datacentres, modular UPS systems offer a way to provide a vertically stacked system. As long as the internal static switch is sized for the overall system size (and any external associated electrical switchgear), additional UPS modules can be added at a later date. For example, a modular UPS system cabinet sized with a 120kW static switch could be installed with only one or two 40kW modules to provide either an N+1 40kW system or 120kW system. This could allow a further 40kW system to be added at a later date to give an N+1 80kW system or 120kW total system. No more floor space is required as the system scales vertically. In comparison, traditional UPS systems have to scale horizontally. Modular UPS systems are hot-swappable; meaning that modules can be added to or removed from a system without downtime. The modules simply plug into the existing vertical rack and power up. Many traditional UPS manufacturers argue against the modular approach. One point they site is that you cannot safely install a UPS module into a live system without risking a crash. This is not a defensible argument. When a modular system arrives on site it can be inspected for any potential signs of transportation damage, just as a traditional system can. The module is then connected to the main system cabinet by sliding into position and connecting. When it is powered up, the UPS module will typically run through in some cases over 400 internal tests and measurements before it signals that it is ready to be connected. Only then will the module breakers close to bring it on-line. This is very much the same approach used by traditional UPS manufacturers when having to add a new UPS system into an N+X arrangement. As well as being hot-swappable, the modules can generally be up and running within 15 minutes of arrival on site. Being low weight they can be fairly easily installed by a UPS service engineer. In contrast a traditional system will require delivery, siting and positioning and then electrical connection, with a total time-to-live from arrival of perhaps one hour or more. Modularity also brings other benefits and these principally focus on service times and reliability. If we step back to actual UPS manufacturing processes, each PCB manufactured and used in an uninterruptible power supply is tested on a bed-of-nails test rig before it is placed into the UPS. The UPS system itself is then inspected and tested both electrically and with some larger systems under life-accelerated conditions. Only then is the UPS put into stock ready for dispatch. If there is a UPS system problem on-site requiring a faulty card to be replaced, how can the traditional UPS manufacturer guarantee the same level of tests and reliability as in the factory. The fact is that they cannot. The only real solution to a main system malfunction is to swap the UPS system out which for large three-phase UPS system can be a logistical nightmare. This is not the case for modular UPS. ‘Simply’ hot-swap the module for a return to base and repair. No downtime and a swap-out procedure that can be done within around 15 minutes. Off course the modular UPS system engineer will also carry out self-checks both pre-install and post-install and so will the replacement module as described. With shorter on-site service times for modular UPS systems, maintenance contract and costs should also be lower providing a more reasonable comparison to traditional UPS when it comes to overall Total Cost of Ownership (TCO) and life costs. In terms of reliability, it can be argued that the controls within a modular systems are more comprehensive and the adoption of two or more module inside the same cabinet provides greater reliability than a traditional N+X system with duplicated control circuitry. 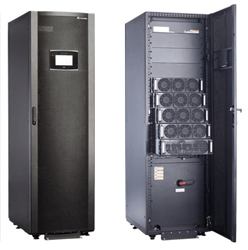 The rate of adoption of modular UPS systems is rising and will continue to do so, especially within the 20-200kVA are of the market. Here the range covers mid-sized comms rooms and datacentres to larger enterprise sites where the modular approach can not only save clients costs in the long term but provide added resilience and future-proof scalability.